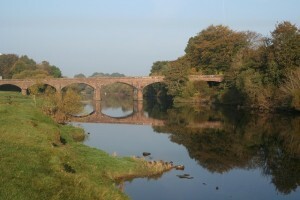 The Queen of the South Viaduct was opened in 1859 to carry the Maxwelltown Railway Line over the river Nith at Dumfries. It is a long curving viaduct, which crosses the river at an angle using skew arches. The structure is grade B listed. The railway line was closed to passengers in 1965 as a result of the Beeching cuts, although a short section continued to serve the Maxwelltown oil depot until 1994 (source). In 2006 Dumfries and Galloway Council in partnership with various funders including Railway Paths Ltd and Sustrans constructed a 3km pedestrian/cyclepath along the former Maxwelltown Railway Line. A section of this route forms part of National Cycle Route 7. In 2008 Sustrans, in conjunction with Railway Paths Ltd, carried out works on the structures within this length of proposed path, including the viaduct. This scheme was the first of 80 individual Connect2 projects extending the National Cycle Network. It now connects North West Dumfries and NCN route 7 with the town centre and the railway station. 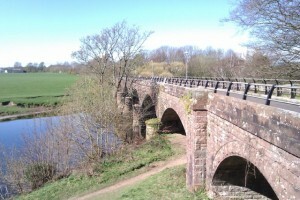 Click here to see the viaduct on Sustrans’ online mapping.